Some schemes need to used together to get the most out of them. Such schemes are covered here. This classic design requires a coordinated threading, tie-up, and treadling. 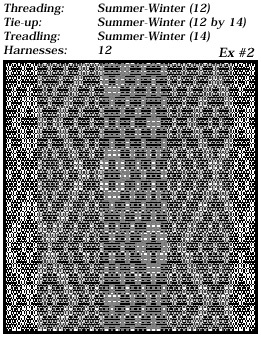 WeaveMaker provides a scheme called “Sum-mer- Winter” for each of these weaving elements. 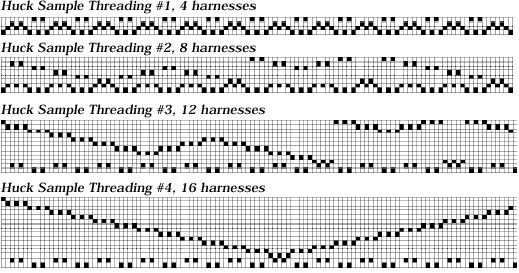 Weaving elements appear here for 8, 12, and 16 harnesses (treadlings at right, tie-ups and threadings below), and sample fabrics created from them appear below. 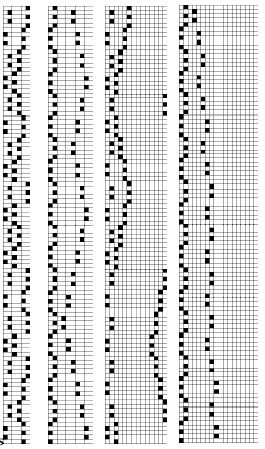 This generalization of a classic design requires a coordinated threading, tie-up, and treadling. 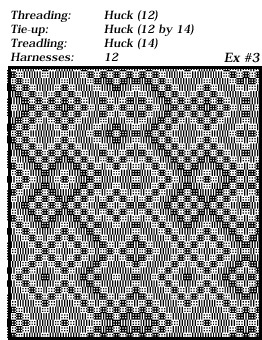 WeaveMaker provides a scheme called “Huck” for each of these weaving elements. 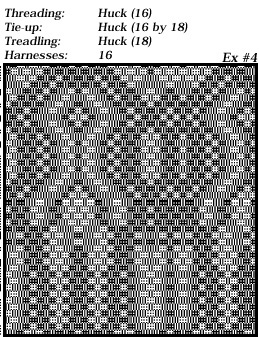 Weaving elements appear here for 4, 8, 12, and 16 harnesses (treadlings at right, tie-ups and threadings below), and sample fabrics created from them appear below. 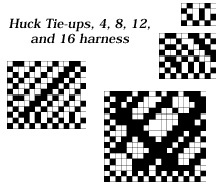 It is possible to independently design two fabrics and then combine their threadings, tie-ups, treadlings (or peg plans) into a single design and weave them as a single fabric on a single loom. 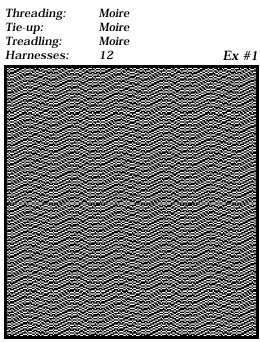 The resulting weave structure will, under certain circumstances, retain some properties of the original ones, and new (and unusual) features are also likely to appear. 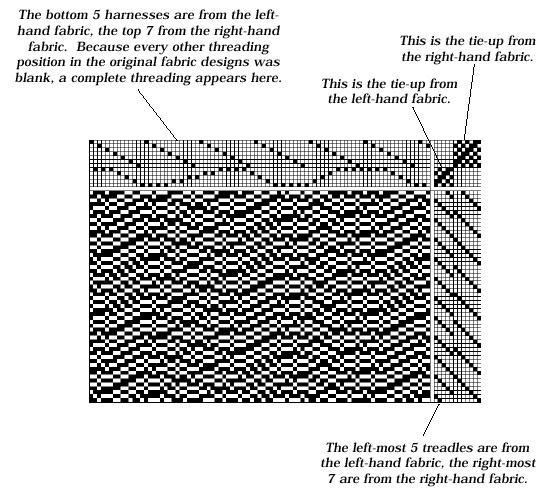 This technique of combining two separately-designed fabrics is called a “divided design.” The two designs at the bottom of this page illustrate two such separate fabrics. 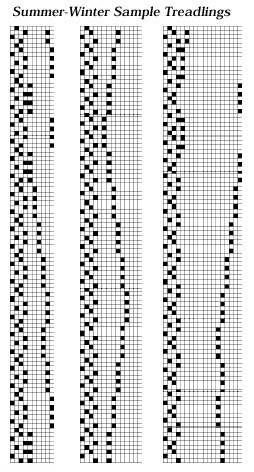 Note that each design omits every other thread, a convenience when subsequently merging the designs. 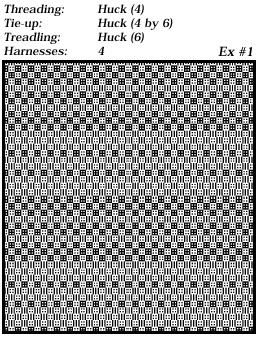 The fabric on the left uses seven harnesses while the one on the right uses five harnesses. 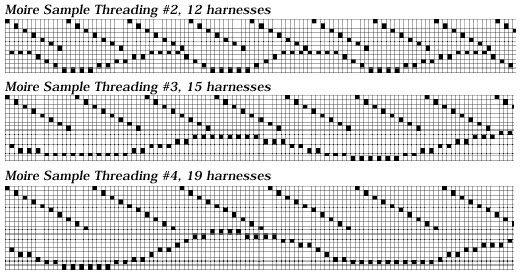 The two designs are merged into a single design by alternating the threadings, putting the tie-ups corner-to-corner, and using the treadlings side-by-side. 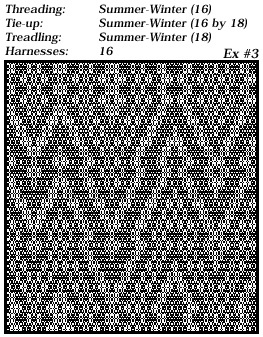 The figure on the facing page shows the resulting design. 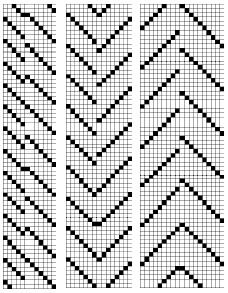 Divided design fabrics can have long floats once the merger is completed. 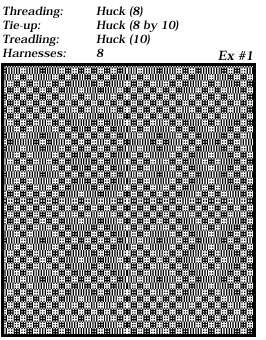 Use WeaveMaker’s full-fabric float analysis tools to detect and correct this problem. 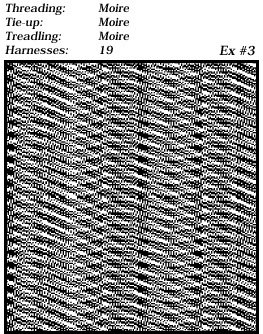 Because the final fabric has to be woven on a loom which has as many harnesses as the sum of the harnesses for the original fabrics, creating interesting final fabrics tends to require a high harness count. 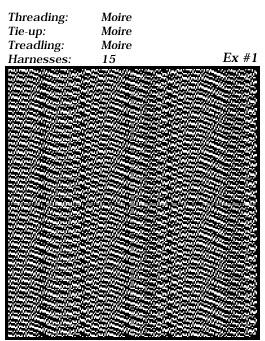 WeaveMaker has coordinated threading, tie-up, and treadling schemes, under the name Moire, which create a divided design fabric design (see the previous page for a definition of “divided design”). 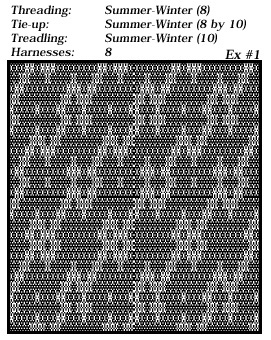 Weaving elements appear here for 12, 15, and 19 harnesses (treadlings at right, tie-ups and threadings below), and sample fabrics created from them appear below.